Tooth Decay Facts: Did you know? 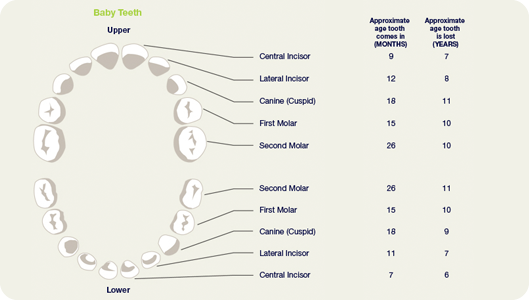 Baby teeth start to erupt through the gums between six and nine months of age. These milk teeth or first teeth help your child eat and speak and also help the adult teeth come in straight. Even tiny teeth must be cleaned. Infants can get cavities just like older children and adults. Following all feedings, you should clean your baby’s mouth and teeth. If the teeth are not large enough for an infant toothbrush, then simply use a piece of gauze or a wet facecloth to wipe teeth and gums. This prepares baby early for what should become a lifelong habit. Baby's first visit to the dentists should occur by the age of one year, or when the first teeth appear.